FITOTRANS Valencia is located at the La Pahilla Industrial Estate in Chiva, alongside the A3 motorway, at km 323. Several separate buildings provide the idea facility for managing a number of lines of business and avoiding possible incompatibilities. This site measures over 18,000 m2. 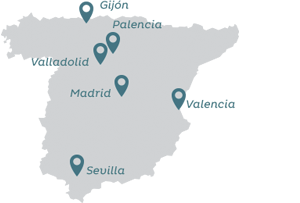 Its location close to the port of Valencia is an excellent advantage in terms of optimisation as an arrival and departure point for primary distribution to other sites. There is a fire station in the same industrial estate. The customs deposit, IATA/OACI shipping and container transit terminal complete the range of services at this site.